With emerald shades,Dance eternal cranes.In the pristine rains,A warm koicha shared.Upon poignant chests.Tranquil prayers kneltJust as Bolaño teases my psyche, Kawabata plays with my rhythmic senses. In his words I find songs of a wintry heart waiting for a prosperous spring. I cannot refrain myself from scribbling lost thoughts in the shadows of Kawabata’s characters. Speaking of shadows; what an enigmatic delusion? The more you walk into it the more it grows; a loyal companion who never departs your physicality no matter how much you want it to leave. And then somehow, on a rainy day you crave for the sun, once again to be able to walk with your humble silhouette. Kikuji lived in and among numerous shadows of his past and present. Like the serpentine birthmark on Chikako’s breast, Kikuji’s past was conspicuous as warts on a toad. 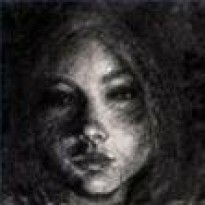 The ugliness of the birthmark that marred Chikako’s luminous skin spewed venomous ghosts through the intoxicated brew. The novel opens with Chikako inviting Kikuji to meet a prospective bride in pretense of a tea ceremony. The purplish mark on Chikako’s breast was all Kikuji remembered about his father’s mistress. As if the mark was an effigy of his father’s betrayal, the anguish of his mother and yet somehow it made him desire its touch in a bizarre way. Yukiko Inamura , a girl with the thousand cranes patterned kerchief was chosen for Kikuji’s miai(matchmaking). Kawabata interlaces the complex emotions in simple characterizations; analogous to the meticulous procedures that of a tea ceremony. Sen no Rikyū is considered as a profound historical figure in the tradition of wabi-cha(the Japanese Way of Tea). In the early 1500s, Rikyū integrated the teachings of Zen philosophies with the simplicity of tea to achieve aesthetics with pristine lucidity. Based on the four Zen principles of Harmony, Respect, Purity and Tranquility; the tea ceremony is more of a spiritual experience than mere drinking of tea. The ceremony that commences with the cleaning of the tea utensils before the tea is whisked, is symbolic to achieving stillness of mind and heart, by eradicating the worldly filth and strives for simplicity. Kawabata however fills the beauty of the tea ceremony with repulsiveness of human complexities and rigid destinies; a befitting paradox to the traditional Japanese art of Tea. Regarding his novel, Kawabata once said, “It is a negative work, and expression of doubt about and warning against the vulgarity into which the tea ceremony has fallen." Unlike other tea masters, Mr. Mitani left a legacy of guilt and melancholic irregularities to his son (Kikuji). With the passing of tea utensils through generations, Kikuji not only inherited the embellished porcelains but also his father’s revolting past and his women. Kawabata uses various tools of the tea ceremony as pictures on a nostalgic wall of grotesque sentimentalities. When Chikako serves tea to Kikuji in his father’s favourite Oribe(a black bowl) for the first time, Kikuji snubs the wistfulness brought by the kitchen-ware. "But what difference does it make that my father owned it for a little while? It’s four hundred years old, after all – its history goes back to Momoyama and Rikyū himself. Tea masters have looked after it and passed it down through the centuries. My father is of very little importance.’ So Kikuji tried to forget the associations the bowl called up.It had passed from Ota to his wife, from the wife to Kikuji’s father, from Kikuji’s father to Chikako; and the two men, Ota and Kikuji’s father, were dead, and here were the two women. There was something almost weird about the bowl’s career. "The same outlook is displayed when Fumiko brings the Shino Jar over to the cottage. "A jar that had been Mrs. Ota’s was now being used by Chikako. After Mrs Ota’s death, it had passed to her daughter, and from Fumiko it had come to Kikuji.It had had a strange career. But perhaps the strangeness was natural to tea vessels. In the three or four hundred years before it became the property of Mrs Ota, it had passed through the hands of people with what strange careers? "The ceramics that once were proud of their serene concoctions were now symbols of forlorn tragedies. Kawabata delineates the corruption of sanctimonious tea ceremony by whisking in human greed and viciousness. 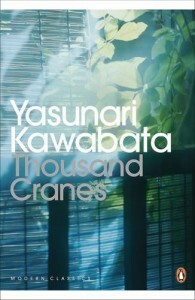 Resembling the serene tea that gets muddied by loosened clay particles., the essence of chaste spirituality vanishes into emotional turmoil ridden by jagged history of the human soul In this book, the tea ceremony upstages the mortals as it takes the centre stage of vanishing traditions and escalating materialistic vulgarity transforming into a laudable protagonist. Furthermore, when Fumiko brings the red and the black Raku bowls over to Kikuji’s cottage, the molded clay become symbols of an incomplete love. The love between Mrs. Ota and Mr. Mitani that was haunted by immoral ramifications; Mrs. Ota’s love for Kikuji as she could not detach herself from his father’s memories; Kikuji’s love for Fumiko that dwelled in sinister shadows of his bedding Mrs. Ota; Fumiko’s apprehensions in reciprocating the warmth burdened with her mothers sins and the malice of Mr. Mitani in Chikako’s sexless existence. In a peculiar way all of it appeared to juxtapose the ghosts raised from the antique bowls. "Though they were ceremonial bowls, they did not seem out of place as ordinary teacups; but a displeasing picture flashed into Kikuji’s mind. Fumiko’s father had died and Kikuji’s father had lived on; and might not this pair of Raku bowls have served as teacups when Kikuji’s father came to see Fumiko’s mother? Had they not been used as ‘man-wife'...."With artistic perfection Kawabata paints the red and black Raku giving a heart to these lifeless objects. The crimson love blackened by shame. The dreaminess of a man’s love and a woman’s devotion perished in morbid fancies.Kawabata does not romanticize suicide. He explores death in depths of salvation for it being the definitive pardon to mortal transgressions. Mrs. Ota’s untimely death or rather suicide brought closure to several irregularities. Her guilt that lived in the Raku bowls churned venom in a sorrowful Shino. Even though one forgives the dead ; the viciousness of the past becomes sorrows of the present. An urge to spit out all the venom.“Death only cuts off understanding. No one can possibly forgive that”....."Guilt never goes away but sorrow does. "Gravely haunted by her mother’s death; ”Maybe mother died from not being able to stand her own ugliness”; Fumiko could not bring herself to love Kikuji for she felt the burden of acquiring the touch that once belonged to her mother. Even the smashing of the Shino did not mitigate Fumiko’s grief of her mother’s ignominy.Conversely, the “death” of the Shino in some way freed Kikuji from the paralytic curse induced by Mrs. Ota’s bond to him. Now, he sensed freedom and for the first time saw Fumiko in a pristine cleanness detached from the all the repulsiveness that once followed her existence. Fumiko was then an enlightened soul achieving the primitivism of the tea ceremony.“He could think of no one with whom to compare her. She had become absolute, beyond comparison. She had become decision and fate. "Leaving traces of the mono no aware concept([b:Beauty and Sadness|14029|Beauty and Sadness|Yasunari Kawabata|http://d.gr-assets.com/books/1327954071s/14029.jpg|1414440]), Kawabata puts forth the idea of 'perishability' being the essence of nature. The indigo morning glory that hung on the gourd in Kikuji’s cottage, in its short life span bestowed flavor in the morning tea fading in the watery oblivion.Chikako’s greed for the antique tea bowls and Kikuji’s guilt over Mrs.Ota’s suicide and his intriguing affinity to the lipstick stained Shino creates a nauseating sense of filth; contradicting the simplistic spirit of the tea ceremony that Kawabata speaks so fondly; gradually disappearing in human greed. The aesthetic transience of beauty that envelops the wabi-sabi concept of accepted transience and imperfection is vivid through the quixotic words of this text and the flawed existence of its people. “Does pain go away and leave no trace, then?’‘You sometimes even feel sentimental for it.” Personally, the picture of thousand cranes is synonymous with Sadako Sasaki, a book that I had read years ago. Sadako, a victim of the Hiroshima bombing, prepared thousand origami cranes as a prayer for her recovery from leukemia. Legend has it that Sadako could not finish the said number of paper cranes; however, her brother Masahiro Sadako asserts that she indeed completed the 1000 paper cranes and it was during her second origami cycle that her youthful life was cut short. In the Japanese culture the crane stand for longevity and good fortune. The tradition of folding 1000 cranes is done when someone has a wish for better health, peace and happiness. Sardonically, the kerchief of patterned crane that the Inamura girl held represented the tragedy of missed chances and missed chances of luck and hope that eluded Kikuji’s fated destiny. The ‘bird of happiness’ after all did not nest in Kikuji’s life .In his Nobel Prize speech Kawabata commented:-"A tea ceremony is a coming together in feeling, a meeting of good comrades in a good season. That spirit, that feeling for one's comrades in the snow, the moonlight, under the blossoms, is also basic to the tea ceremony. A tea ceremony is a coming together in feeling, a meeting of good comrades in a good season. I may say in passing, that to see my novel Thousand Cranes as an evocation of the formal and spiritual beauty of the tea ceremony is a misreading. It is a negative work, and expression of doubt about and warning against the vulgarity into which the tea ceremony has fallen.As the fragrant tea emits transitory life into the tinted ceramics, Kawabata brilliantly bring beauty in the dynamism of nothingness exposing the conundrum veiled within the peaceful periphery of mortality.